Debbie is continuing to share her trip diary from the GP team trip around New Zealand. In part two Debbie and Nicky take some time between visits to local Hospitals and General Practices, where they have been updating their knowledge of the New Zealand healthcare system, to discover the strong and celebrated traditional culture of Rotorua. After bidding Tauranga a fond farewell, it was back in the car for a short drive down to Rotorua. The landscape that unfolded in front of us was stunning and made the journey all the more enjoyable. Highway 36 took us through picturesque scenery of rich farmland with a mountain range towering in the distance. 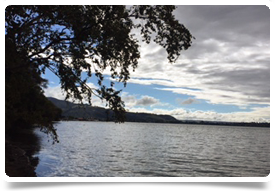 It was early afternoon when we arrived in Rotorua and we headed straight to the hospital to meet with another of our clients on behalf of our Consultant Team colleagues. The hospital opens up into a bright and spacious seating area. 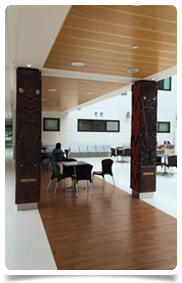 The pillars and walls are decorated with beautiful pictures, tapestries and Maori designs. It gave this area a very calming and welcoming feel. 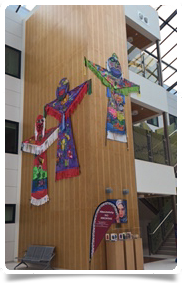 In our meeting we heard all about how the hospital operates and supports the surrounding communities. From the hospital we drove to a practice in the centre of Rotorua where we placed a GP couple. It was great to hear how well they have settled into New Zealand life. So much so, that they have now been granted their permanent residency and are also applying for their fellowship in New Zealand. We decided to have a drive around Rotorua to see the beauty of this town first hand before heading to our hotel. We come across the Government Gardens. These grounds are stunning. 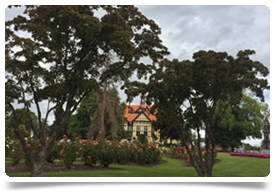 When you head down the main driveway, you are greeted by a beautiful old building which houses the Rotorua Museum of Art and History. We parked up by the lake and walked back through the rose garden, stopping to view the art work and sculptures along the way. 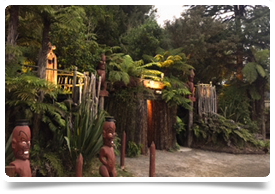 After strolling round the grounds we were eager to get back to the hotel to get ready as we were booked onto the Maori Experience that evening at Tamaki Maori Village. 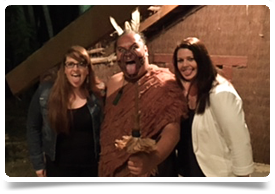 I was so excited to experience an evening of New Zealand’s Maori culture after hearing and reading so much about it. The bus collected us from outside our hotel and it was already buzzing with excitement for the evening ahead. The Waka (coach trip) was only a short journey and our guide went through the rules and protocol for entering the Marae (the village). 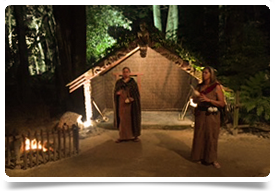 Once we arrived, before we could enter the Marae, the Powhiri (formal welcome) was performed then the Karanga, or welcome call, echoed across the courtyard signaling we were now welcome to enter their Marae. Once inside, the Tangata Whenua or people of the land demonstrated different traditional activities which have been restored by the young people of today. From the Marae we entered their meeting house or Wharenui (the big house). Here the culture group shared a variety of Waiata and Haka, (songs and dances) which told stories of a proud race - TE MAORI. To see the Haka performed less than five feet in front of me was just phenomenal. From there it was over to see the Hangi (earth oven) and then into the Wharekai (the food house) to enjoy a delicious traditional Hangi. The evening then came to a close with the Poroporoaki (closing ceremony). I just love how the Maori people and their culture is recognized, respected and celebrated. Everyone was so accommodating and friendly and they got everyone involved in the evening. I couldn’t recommend this highly enough. If you are ever in Rotorua, you have to go to experience this for yourself. From there it was back to the hotel for a good night’s sleep as the following day was to be our busiest day yet… Next stop, Taupo, Napier, Hawkes Bay and then back down to Napier all in one day!